Current research approaches in lymphoma focus on reduction of therapy-associated long-term side effects. Especially in mediastinal lymphoma, proton beam radiotherapy (PT) may be a promising approach for reducing the dose to organs at risk (OAR). In total, 20 patients were irradiated with active scanning PT at Heidelberg Ion Beam Therapy Center (HIT) between September 2014 and February 2017. For comparative analysis, additional photon irradiation plans with helical intensity-modulated radiotherapy (IMRT) were calculated and quantitative and qualitative dose evaluations were made for both treatment modalities. Toxicity and survival outcomes were evaluated. Clinical target volume coverage was comparable in both treatment modalities and did not significantly differ between IMRT and PT. Nevertheless, PT showed superiority regarding the homogeneity index (HIPT = 1.041 vs. HIIMRT = 1.075, p < 0.001). For all OAR, PT showed significantly higher dose reductions compared with IMRT. In particular, the dose to the heart was reduced in PT (absolute dose reduction of Dmean of 3.3 Gy [all patients] and 4.2 Gy [patients with pericardial involvement]). Likewise, the subgroup analysis of female patients, who were expected to receive higher doses to the breast, showed a higher dose reduction in Dmean of 1.2 Gy (right side) and 2.2 Gy (left side). After a median follow-up of 32 months (range 21–48 months), local and distant progression free survival (LPFS and DPFS) were 95.5% and 95.0%, respectively. Radiotherapy was tolerated well with only mild (grade 1–2) radiation-induced acute and chronic side effects. A significant reduction in the dose to the surrounding OAR was achieved with PT compared with photon irradiation, without compromising target volume coverage. Dosimetric advantages may have the potential to translate into a reduction of long-term radiation-induced toxicity in young patients with malignant lymphoma of the mediastinum. Forschungsschwerpunkte in der Therapie von Lymphompatienten befassen sich zunehmend mit der Reduktion von Spättoxizitäten. 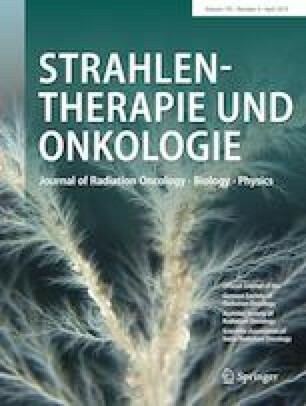 Aufgrund der verbesserten Dosisreduktion an Risikoorganen (OAR) kann die Protonenradiotherapie (PT), insbesondere bei Patienten mit mediastinalen Lymphomen, einen vielversprechenden Therapieansatz darstellen. Von September 2014 bis Februar 2017 behandelten wir 20 Patienten (medianes Alter 31 Jahre) mittels aktivem Rasterscanning mit einer PT. Zusätzliche Photonenbestrahlungspläne mittels helikaler intensitätsmodulierter Radiotherapie (IMRT) wurden berechnet und quantitative und qualitative Vergleichsanalysen durchgeführt. Zudem wurden Toxizitäten und Ansprechraten evaluiert. Die klinische Zielvolumenabdeckung war vergleichbar und zeigte keine signifikanten Unterschiede zwischen beiden Behandlungsmodalitäten. Es zeigte sich jedoch eine Überlegenheit der PT bezüglich der Homogenität (Homogenitätsindex [HI] HIPT = 1,041 vs. HIIMRT = 1,075; p < 0,001). Des Weiteren ließ sich mittels PT eine signifikante Dosisreduktion an den OAR erreichen. Insbesondere die mittlere Herzdosis zeigte eine signifikante absolute Dosisreduktion von Dmean 3,3 Gy (bei allen Patienten) und 4,2 Gy (bei Patienten mit präkardialem Lymphombefall). Zudem profitierten Patientinnen von einer Dosisreduktion am Brustdrüsengewebe mit einer absoluten Reduktion von Dmean 1,2 Gy (rechts) und 2,2 Gy (links). Nach einem medianen Follow-up von 32 Monaten (Spanne 21–48 Monate) betrug das lokale bzw. distante progressionsfreie Überleben (LPFS bzw. DPFS) 95,5 % bzw. 95,0 %. Es traten lediglich milde Nebenwirkungen (Grad 1–2) durch die Bestrahlung auf. Mittels PT zeigt sich im Vergleich zu einer Photonenbestrahlung eine signifikante Dosisreduktion angrenzender OAR bei Patienten mit mediastinalen Lymphomen, ohne dabei eine Beeinträchtigung der Zielvolumenabdeckung in Kauf zu nehmen. Diese dosimetrischen Vorteile bergen insbesondere bei jungen Patienten mit mediastinalen Lymphomen das Potenzial, sich in einer Reduktion der Langzeittoxizitäten niederzuschlagen. This work was supported by the Medical Faculty of Heidelberg providing a research grant for LK. L. König, N. Bougatf, J. Hörner-Rieber, N. Chaudhri, T. Mielke, S. Klüter, M.F. Haefner, S. Rieken, T. Haberer, J. Debus and K. Herfarth declare that they have no competing interests. All procedures performed in studies involving human participants were in accordance with the ethical standards of the institutional and/or national research committee and with the 1964 Helsinki declaration and its later amendments or comparable ethical standards. Ethical approval was obtained from the local Ethics Committee of Heidelberg University (S-201/2017).